100 timbres, 50 rhythms and 10 integrated songs provide variety - the LSI sound source and 8-note polyphony. $49 Seen a lower price? 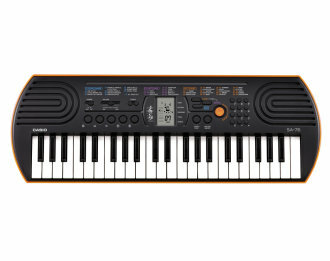 The 44-key Casio SA-76 offers all discoverers of music the essentials for playing those first tunes. 100 timbres, 50 rhythms and 10 integrated songs provide variety - the LSI sound source and the 8-note polyphony ensure good sound quality. The LC display helps with selecting and calling up the different music options. The Casio SA-76 also includes a striking change-over switch making it easy to switch between the piano and organ modes. Otherwise the colours of both mini keyboards are different: the lower housing on the Casio SA-76 is red-orange. Whether opting for the bright colours or the unobtrusive grey - both SA models add a creative mix to a child's bedroom. Available until 11 PM (EST) today. Mention special code 20W-KVZB when you call.